I have just opened the website of C7 Bit Proprietary Limited – a HYIP, which claims to be almost 200 days old. Since I have some suspicions that this program has been a sleeper, let’s assume its second birthday is on 12th of October 2017 when admin decided to join Sticky Listing on the DavidNews.com monitor. This is another cryptocurrency inspired HYIP, which seems to be a growing trend in the last couple of months. Now I have reinvested in this program $360 and will keep you informed about the performance of payments. Keep reading to find out more about C7 Bit Proprietary Limited. First, when I heard the name of this program I thought it sounds familiar to me. Sure, I write about many HYIP’s and there is a possibility that two different admins use same terms in HYIP names. However, after googling the word “proprietary” I found my own review written in the April of this year about a program called Zooo Proprietary Limited. Later HYIP was a sleeper, which collapsed a long time ago (by the way - it was a gigantic project). Use of a word doesn’t prove anything. However, both were sleepers and had similar basic Gold Coders website templates at the beginning. How is this information helpful for the reader? Well, if these two are projects from the same admin you can predict some sort of patterns and estimate the potential of the project. Luckily, admin made a redesign for its second breath. It looks way more attractive than standard Gold Coders template. After spending few minutes on the home page and paying closer attention to details we can notice that admin was influenced by Bitcoin and cryptocurrencies. C7 Bit Proprietary Limited logotype with Bitcoin symbol, homepage main image with the Bitcoin in the center and other images present on the website – all with the intention to indicate a relation to cryptocurrencies. Moreover, there is something about the lucky number 7. It’s in the HYIP name, 7% daily for 17 days and even 7% referral commission. All withdrawals in C7 Bit Proprietary Limited are processed within 27 business hours. Sure, the admin couldn’t resist to include 7 even here. I believe 7 or 17 hours of processing time wasn’t enough and 24 hours has become a standard. In case you are interested earning referral commission, you can earn 7% of any deposit made by your referrals. Registered user area displays all standard features like active deposit, total earnings, and personal referral link. You can also follow the information about last deposits and withdrawals without leaving the personal account. However, this information is also available on the homepage. Of course, I wouldn’t pay much information to it because it’s located there to convince us about the performance of this HYIP. However, this information can be manipulated any direction. Minimum deposit to join C7 Bit Proprietary Limited is $7.77 and maximum $17777. At the homepage, we see that there is only one investment plan available – 7% daily for 17 days. Keep in mind that the deposit is also included in this 7%. How much could we make in case this program will not collapse in the middle of the 17 days investment cycle? An investment of $200 would make a daily profit of $14. After 15 days deposit would reach its breakeven point and at the end of the term, such deposit would make a profit of $38. But at the moment when we open user area, it becomes clear that project offers several other investment plans such as 1.7% daily for 27 days with initial deposit returned at the end of investment term and 177% after 27 days. The reason why I did not cover other investment plans except the one that pays for 17 days is that I personally think that other investment plans are not that safe and if you invest than 7% for 17 days is the plan that I believe is the best one here. We all noticed the obsession with number 7. I mean, it’s everywhere and it gets really annoying at a certain stage. C7 Bit Proprietary Limited website looks like an average website in terms of web design and performance. In the meanwhile, all important information about the program is out there on the home page or additional website pages. Initial deposit is included in payments and the actual daily rate is somewhere around 1.11% a day. However, 17 days investment term seems quite ok even though the initial deposit is included in the payments. Unfortunately, we can’t predict how long has been the active phase of this sleeper project and it’s impossible to predict when it will stop paying. As usual, I’m here to collect information and share my thought and I will never suggest investing in on or another program. Therefore, if you ever decide to make any investments, don’t invest more than you can afford to lose! Have you already made a deposit and finished your first investment term of 17 days? Please drop a message in the chat box and tell us what you think about C7 Bit Proprietary Limited! Investment plans: 1.7% for 27 business days, initial deposit returned at the end of the investment term. 7% daily for 17 calendar days, initial deposit included in the payments. 177% after 27 days, initial deposit included in the payment. Ignore other investment plans. 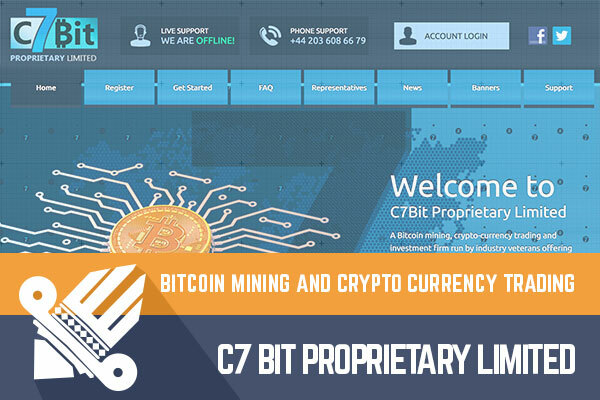 Join C7 Bit Proprietary Limited Here!